I had been studying in the hostel for one semester then. Everything seems to become normal to me. I have met new friends. Classes were smooth, and nothing abnormal happened to me throughout the semester. Students were all chattering away, as the last exam paper ended that afternoon. Some were packing their belongings, and some were just hanging around waiting for the last minute to pack their things. All of us were going back home for the semester break. Or maybe it is more suitable to call it a holiday, because it was a one and half month’s break. I was one of the students who were still the shy type. I quietly packed my things into my big bag. My other three friends had finished packing, so they were now chatting with each other excitedly. All of them came from the same city. Therefore, they speak the same dialect. As for me, I come from further down the map. So, mostly I don’t quite fully understand them word per word. I only understood the whole context of their conversation. But I knew they were very excited because that day all of them will go home. The school had divided us into two trips - The students who live in the northern area will be sent by school bus one day earlier than the students who live in the southern. I was happy for them. But I had been thinking to myself quite a number of time lately. What will happen to me tonight? I made my own calculation. It was unfortunate that all my close friends were from the northern. Maybe because they were the nearest people around me. All the cubes in my line were occupied from northern students, except me. Well, I have been thinking of asking a classmate to accompany me that night. But that particular girl has never spoken to me before, and I am not the type of person who knows how to start a conversation without being labeled as rude. Heck. People always have this interpretation when they first knew me. Many people said I am rude to them. But.. I don’t understand why they said that. Well, I don’t want to give them a damn care. Better still if I mind my own business. So, I decided that I was going to spend the night alone in my cube. It had been a long semester, and nothing had happened during that long time. I was sure nothing strange would happen to me that night. The day passed by mercifully. I finished packing my things, and I went down to wave goodbye to all my northern friends. It was already eight p.m. then. I didn’t have dinner, because I didn’t find any friends to accompany me. So, I went straight to my cube. I intended to read a good story book so that I would kill the time effortlessly. Hah hah. Actually I was scared! But I had nothing else to do. There was nobody to turn to, and the remaining students were far away downstairs. Stuck up with my extreme shyness, I closed the door of my cube. I left the lights on and I instantly jumped onto the bed. I opened a thick story book, and began reading. I tried to focus on the reading, and to immerse in the story. I don’t want to think about anything else but the story. After a while, I began to enjoy the reading and my mind began to relax. Soon afterwards, I began to feel sleepy. I looked at the watch. It was almost midnight. Sometimes the creepy feeling crawled into my nerves but I tried to ignore it because it was the only clever thing to do. I lay down on the bed, and still reading. I hoped in that way, I would be able to fall asleep. And to my surprise, I dozed off. It was what happened after I woke up that made me shiver all over. It was 3 or 4 am. 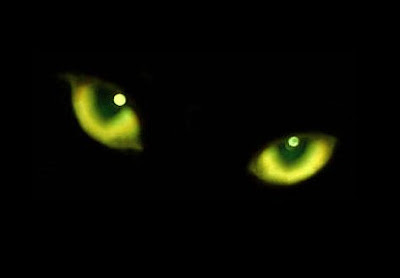 As soon as I opened my eyes, I saw a black cat gazing down at me right in front of me. Its two front legs were on my chest, and its two hind legs were on the bed. Its eyes didn’t blink even a bit, and its glare made all the hair on my skin stood on ends. Out of nowhere, a feeling of rage suddenly gathered in my chest. I collected all the energy that was left in me, and screamed my lungs out. “You devil! Son of devil! God will send you to hell!” I didn’t know why I said that, but I felt like it was the natural thing to say at that moment. I pushed the cat off with all my might and I didn’t dare to see where it ran to. I just prayed that the cat would not come again. Soon, the cat disappeared out of sight. At that time, I realized several strange things had happened. I looked around the cube. It was dark, and obviously the lights were off. Didn’t I left the lights on the whole night? I was sure the light was still on when I lay on the bed. Who turned the lights off? Who? I looked at the door. It stood there, ajar. I had locked the door. I remembered very clearly. I had locked the door, sat on the bed and opened the book. My heart began beating real fast. I must run away from this terrible fear. But, where to? At this hour, who would want to open her door if I knock? As fast as I could, I reached the plug and switched on the lights. I locked the door, but this time I sat straight on my bed. I don’t want to read anything. I wanted to be alert. If something happened again, I wanted to be ready. “This time, I am going to be ready,” I thought about that again and again. I sat there, rocking back and forth to overcome my fear until the first hint of dawn appeared. Soon afterwards I began to hear footsteps from downstairs, footsteps of the girls going to the toilet to wash up and start a new day. I quickly went to the toilet, washed up and prepared myself to go home. I took my bag with me, and never dared to turn back. I skipped my breakfast, and sat in the foyer building until the bus came. I would never forget that incident, ever. That happened to a person in a city a cat was sitting on her when she woke up there was a cat and in her town they would say that the cats would try to trade heart with the person there on.